We recently received this letter letter from a Hawken Energy outdoor wood furnace owner as a comment on a previous post. Thank you for your insights. It's always nice to hear from our customers. We appreciate your tips and we hope this post will help other with their outdoor wood burning this year. About the tool you've asked for. We've tried several different designs and may be releasing a tool in the future. Thanks for your feedback. We had a cold winter last year by our northern Pennsylvania standards, so I felt lucky having installed the HE-2100 just prior to the heating season. Although I did have a few problems which took until the beginning of this year’s heating season to rectify. Admittedly, the 2100 always heated my 4,200 sq/ft house and I never ran out of domestic hot water, but I was filling it four times a day and shoveling out the ashes with charcoal briquette sized unburnt wood twice a week. It was extremely frustrating to have to fill it at 11:00PM and get out by 5:00 AM to keep the house warm. This year it’s a different story. I easily get 12-hour burns using less wood and only two shovels of ash a day. I also went through 11-cords on a well-insulated house. The process I’ve been using this heating season works very well--so here’s a few tips.
. Before I got the HE-2100, everybody was telling me how great they worked and that “those boilers” would burn logs no matter the size and/or type. So I cut all my logs 24” in length (the max for the hydraulic splitter) and split 18”-24” diameter logs only in half. (I use only seasoned Red & White Oak and Hickory for burning.) While indeed, there’s no problem with the Hawken burning these logs, there IS a problem with getting enough of them stacked toward the rear of the burn box. This year, I cut about half my wood very short (about 12”-16” split small) and split most of the long pieces into a narrower width. This allows for much easier loading and more wood due to it being lighter and thus easier stacking —even my wife can do it. With the short pieces, I can get two rows of wood in the firebox for those extra cold nights. The long narrow split pieces are easy to load onto the top and the sides of the burn pile—as you should load as much as possible at 12-hour intervals. Resist loading wood between your load times as this only makes things harder at load time. I used to do this when working outside figuring it would help. It doesn’t. I’ll explain why below. Another thing I didn’t do my first year was to rake the burning coals forward when refilling. Not pulling the hot coals forward is what caused the briquette-sized unburnt wood of the first year. Admittedly, had I followed the Owner’s Manual a little more closely regarding the ash pull, I may not even be writing this. Still, it’s so important I would like to see an ash-pulling tool be included with the initial purchase and a little more instruction from the dealer. Right now I use a narrow steel rake. A six-foot long metal pull rake with an an arc-shaped edge would be super. “The refill process” – When I open the door after 12-hours, all that’s left burning are the red hot coals. I first shovel out the front 12-inches as this has mostly turned to ash by now. 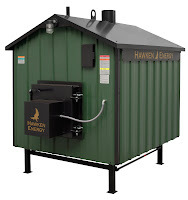 The coals closest to the fan burn very hot and turn to dust—thus raking forward on each load gives you more heat efficiency by leaving no unburnt wood. I then rake to the front all the coals from the rear of the firebox, leaving at least 18-inches of the firebox floor exposed. By giving yourself this added space, it ensures a fully-loaded firebox using the various-sized wood process as explained above. Maybe I did things totally wrong last year and was my own worst enemy, but I’m happy I finally have this down to a science. This was a very helpful post. I'm following Bob's procedures and find the wood burns longer and I don't feel like I'm "fighting" the loading process (I'm a 50-something, 5'2" woman). Question: what about ash disposal? Once it is cool what to do with it? Thanks! Patti, Thanks for your comment. The article titled Best Management Practices for Wood Ash gives great advice for using the ash (I tried to paste the link above, copy and paste it into your browser address bar if the link isn't active). If you don't have a garden or someplace to spread it on your property can could maybe haul it to a dump. Thanks Don, for the link, it was helpful. I'm sure we'll be able to spread the ash on our 13 acres! Thank you for the helpful post. When I bought my outdoor wood furnace last year, it took me a bit of practice to get things down pat. Now that I have, everything runs perfectly. I've been saving so much money year after year.